Ink Web Solutions build robust and cutting-edge Drupal websites to bring you powerful web solutions. Ink Web Solutions is a leading Drupal development company India. We have team of Drupal experts, serving many clients throughout the world working with Drupal. Ink Web Solutions offers quality drupal development which enable your website and makes it better returns. we have large team of experienced Drupal CMS developers India providing very high efficient solutions to our clients. 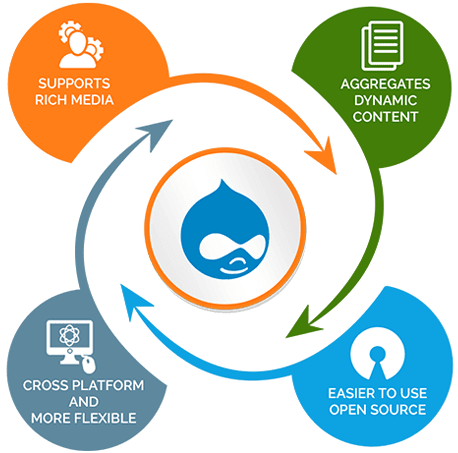 Drupal have lot of advanced and powerful features, Ink Web Solutions Drupal Development team has focused itself to provide best and high quality of services in Drupal CMS Development. Our Drupal experts team of development have advance knowledge of Drupal open source for provide the best result to client. Ease of changing the look and feel of your site by allowing you to modify or customize the theme as per your needs & deeds. Chandigarh's Leading Drupal Web Development Company ! Ink Web Solutions provides Drupal Web Development services in Chandigarh, Mohali, Himachal Pradesh and India. Chandigarh's Most Trusted Drupal Development Company. At Ink Web Solutions, we have crystal clear fundamentals and in-depth knowledge about the Drupal platform and thus, offer scalable, reliable and end-to-end Drupal development services serving our client's requirements.